When designing a temperature detection circuit, it is important that you don’t pay for more than what is actually needed. By understanding the requirements of an application, an optimal temperature sensor can be selected that minimizes cost without compromising performance, accuracy, or reliability. There are several factors to consider when selecting a sensor. They are outlined in the table below. The first consideration when selecting a temperature sensor is temperature range. For operating environments over 1000 °C, for example, a thermocouple is often the only option. However, only a few applications involve such extreme temperatures. For most industrial, medical, automotive, consumer, and general embedded systems, the typical operating temperature range is much narrower. When semiconductor-based components are in use, the range is even more limited. For example, MCUs for commercial and consumer applications are rated at 0°C to 85 °C. MCUs for industrial applications extend the range to -40 °C to 100 °C while automotive MCUs need to operate from -40 °C to 125 °C. Thus, engineers often have the option of using any of the standard types of temperature sensors. A temperature detection component needs different packaging, depending upon what is being measured. For example, a semiconductor-based sensor cannot be immersed directly in hot oil. A low-cost sensor may be protected by an epoxy coating. For higher temperature operation, the temperature sensors can be hermetically sealed in glass. This also protects them from other environmental factors, including liquids and debris. Sensors can be placed in stainless steel housing for greater robustness. The more complex the housing required, the greater the cost for the sensor. Sensors also come in a variety of shapes and sizes. Selecting the appropriate sensor for an application can improve performance, responsiveness, and reliability. For example, all temperature sensors are subject to self-heating due to the power running through them. This self-heating raises the ambient temperature around the sensor, thus introducing error and negatively impacting accuracy. With an NTC thermistor, the mass of the sensor can be increased to reduce the errors due to self-heating. Even a small change in size can have a large impact on reducing self-heating. For example, a 3 x 3 x 3 mm thermistor has more than 3X the volume/mass compared to a 2 x 2 x 2 mm thermistor. This flexibility is only possible with a thermistor. Semiconductor-based sensors by their nature are fixed in size. As both RTDs and thermocouples are wire-based, this limits an engineer’s ability to adjust their mass to reduce self-heating errors. A temperature sensor can drift over time, depending upon the materials, construction, and packaging used. For example, an epoxy-coated NTC thermistor changes by 0.2 °C/year while a hermetically sealed one changes by only 0.02 °C/year. Platinum RTDs offer excellent stability as well: 0.05 °C/year for film and 0.002 °C/year for full wire. Both thermocouple and semiconductor-based sensors have much lower stability at 1 °C and 2 °C/year respectively. Stability is important in applications that need to be operational for many years. The effects of stability can be mitigated if the system can be calibrated from time to time, though this comes with the trade-off of introducing maintenance complexity and cost. Ideally, the stability of the system is enough to extend through entire expected operating life. Without a reliable detection circuit, the quality and reliability of temperature control and compensation functionality degrades. There are several factors that affect the accuracy of a temperature detection circuit, including resolution and responsiveness. Accuracy is clearly a concern for applications where precise temperature control is required. However, accuracy can also have a substantial in applications where temperature is solely a reliability concern. Consider an embedded system that employs a fan to keep the MCU from overheating and as a result losing reliability. The fan turns on whenever an upper threshold is exceeded. If a low-cost thermocouple is used, the accuracy of the measurement could be off by up to 5 °C. In addition, the responsiveness of such a thermocouple is on the order of 20 s. This means that when the upper threshold is exceeded, the temperature might have been rising steadily for another 20 s before the system can register the change. It might also take additional time for preventative measures to take effort. Furthermore, with a stability of 1 °C/year, a device expected to operate for 10 years will need to account for another potential 10 °C variation. When selecting the upper threshold temperature, engineers have to take into account that this thermocouple-based detector circuit could be 5 °C and 20 s behind where the system truly is. One solution to the accuracy issue is to calibrate the detection circuit during manufacturing. However, this adds undesirable expense. More commonly, engineers will lower the upper threshold to a level where, to compensate for the 5 °C variation and 20 s delay, the system will have less chance of overheating beyond its reliability limits. A lower threshold, however, means that preventative measures will be enacted sooner than they would need to be with a more accurate and responsive detection circuit. It’s like running the A/C when you don’t have to. Such overuse impacts the reliability of the fan and consumes more power than necessary. An NTC thermistor is able to achieve the highest accuracy of the basic sensor types within the -50 °C to 250 °C range. Accuracy ranges from 0.05 to 1.5 with high long-term stability, depending upon the type of sensor and packaging used. NTC thermistors also offer superior responsiveness, on the order 0.12 to 10 s. Contrast this to the very slow responsiveness of a platinum RTD or semiconductor-based detector at 1 to 50 s and 5 to 60+ s respectively. By the time other components have registered a change in temperature, an NTC thermistor-based circuit has already enabled the system to take corrective action. The result is that with an NTC thermistor, engineers have the ability to select a tighter upper threshold, optimizing both fan reliability and power consumption. In addition, because of its fast responsiveness and the wide dynamic range of its output resistance, NTC thermistors can be very accurate over even a small range of temperature. This makes them extremely versatile across a wide range of embedded applications. There are other factors that affect accuracy, including susceptibility to electrical noise and lead resistance (i.e. noise arising from the leads coming out of the temperature sensor component). While thermocouples are not affected by lead resistance, they are the most susceptible to electrical noise, especially cold junction thermocouples. Semiconductor-based sensors also experience no lead resistance but immunity to electrical noise depends upon the board layout. Platinum RTDs are fairly immune to electrical noise but they are quite susceptible to lead resistance noise, especially in 3- and 4-wire configurations. NTC thermistors, because their initial resistance is so high, have excellent noise immunity to both electrical noise and lead resistance. The cost for a temperature detection circuit typically rises with increased accuracy for a particular sensor type. More robust packages will also increase cost. For applications in the temperature range of -50 °C to 250 °C, platinum RTDs have the highest cost of up to $6. Semiconductor-based sensors are the next highest, at around $0.9. Thermocouples have a reputation for being low cost, but are actually moderate in cost at $0.5. NTC thermistors come in at the lowest cost at <$0.2 for a hermetically sealed, glass encapsulated sensor. If the application does not require a hermetically sealed sensor, NTC thermistors can be less than $0.5 each in volume. 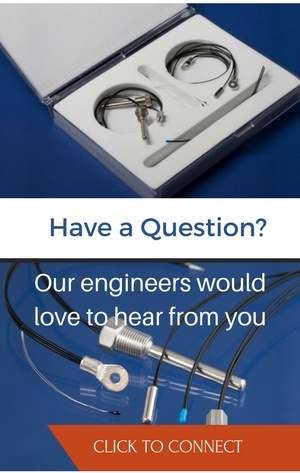 Do you have questions about selecting temperature sensors? Send them below!